All 11 filamentous marine basidiomycetes have a reduced fruit body and this has hampered their assignment to higher taxonomic groups (Hibbett and Binder, 2001; Binder et al., 2006). Like marine ascomycetes and anamorphic fungi, they are secondary invaders of the marine environment (Spatafora et al., 1998; Binder et al., 2006). Two independent lineages amongst the true agarics have been demonstrated: the Nia clade (related to the cyphelloid agarics) and the Physalariaceae clade (highly reduced stipitate-pileate agarics) (Binder et al., 2006). Other lineages include the Digitatispora clade (Atheliales?) and Haloal. mangrovei (Russulales) (Hibbett and Donoghue, 1998; Binder et al, 2001; Hibbett and Binder, 2001; Maekawa et al., 2005). It remains to be determined if Haloal. mangrovei is truly marine as it was reported from intertidal mangrove wood. A fifth lineage includes Melanotaenium ruppia (Ustilaginomycotina, Urocystales, Melanotaeniaceae). 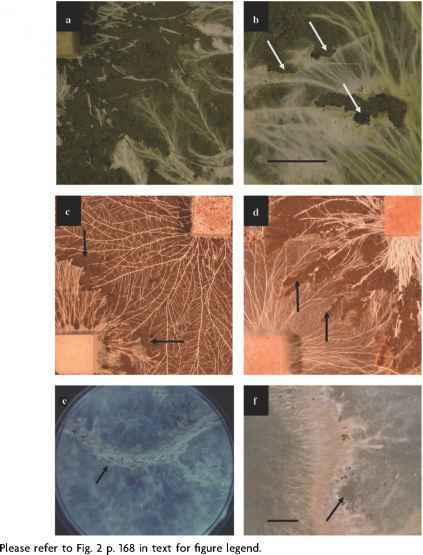 Of the 11 filamentous marine basidiomycetes, 6 have appendaged basidio-spores that aid in their dispersal and entrapment (Jones, 1994), while in C. man-grovei and H. villosa they are not appendaged but are also discharged passively (Kohlmeyer and Kohlmeyer, 1979; Nakagiri and Ito, 1991). Unlike their freshwater counterparts, marine basidiomycetes do not produce anamorphs (Webster, 1992). In Haloc. villosa the basidiome is cyphelloid and the upper opening covered by three layers of hyphal tissue, which subsequently separate or uncoil as the basidiome develops (Nakagiri and Ito, 1991). These hyphal layers protect the hymenium from exposure to water and allow basidiospores to develop. At maturity, basidiospores are pushed through the opening in the hyphal layer and accumulate at the tip of the basidiome and are dispersed by the incoming tide. It is not known whether they are also released under water. Hibbett and Binder (2001) speculated as to the possible evolution of the marine filamentous basidiomycetes and considered N. vibrissa as the most derived member, with a shift from terrestrial to periodically immersed to fully submerged substrata, loss of basidiospory, evolution of appendaged spores and an enclosed fruit body. They hypothesized that the mangrove-inhabiting Haloc. villosa may be morphologically and ecologically intermediate between N. vibrissa and terrestrial cyphelloid forms such as Cyphellopsis anomala. The freshwater basidiomycete Limnoperdon incarnatum has sessile non-ballistosporic basidiospores and cyphelloid basidiomes, but lacks the hyphal layers found in Haloc. villosa (Nakagiri and Ito, 1991). In basidiomes that develop on the surface of water, the peridial wall is hydrophobic and the hymenium is not exposed to water. Dispersal is then by flotation, as in aero-aquatic hyphomycetes and the basidiomycetes P. glomerulata and N. vibrissa. In the latter species the peridial wall breaks open and the spores are released passively (Fazzani and Jones, 1977), but in L. incarnatum spore release has not been reported (Nakagiri and Ito, 1991).